The development, financing and construction of the IGB pipeline is under the responsibility of the joint venture company ICGB AD, which will be the owner of the pipeline. 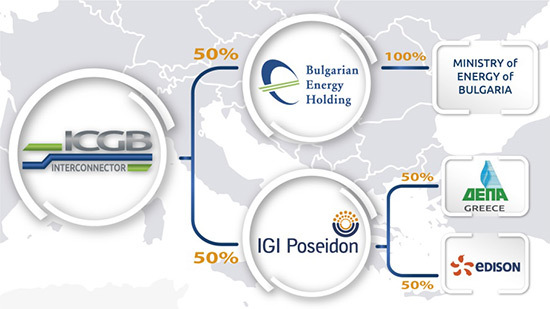 ICGB AD was incorporated in January 2011 by BULGARIAN ENERGY HOLDING EAD and IGI POSEIDON S.A. under the Bulgarian Law, with each shareholder owning 50%. IGB Project- Gas Interconnector Greece-Bulgaria is co-financed by the European Union's European Energy Programme for Recovery programme.